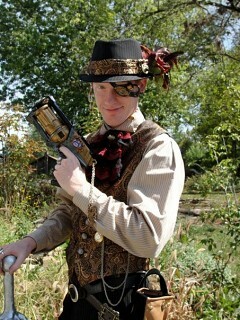 I finally finished a complete steampunk outfit! I want to make other outfits for my character, this is essentially his 'pimp' gear when he's out trying to bring in customers. At some point I'mm make his engineer outfit and if I'm lucky some day I'll get to making his can-can dress. Yes, this shares a lot of stuff from my other original character, so blah.